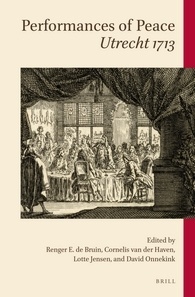 Collection of essays on the Peace of Utrecht, with an introduction by the editors: Renger E. de Bruin, Cornelis van der Haven, Lotte Jensen and David Onnekink. Volledige The Peace of Utrecht (1713), which brought an end to the War of the Spanish Succession, was a milestone in global history. Performances of Peace aims to rethink the significance of the Peace of Utrecht by exploring the nexus between culture and politics. For too long, cultural and political historians have studied early modern international relations in isolation. By studying the political as well as the cultural aspects of this peace (and its concomitant paradoxes) from a broader perspective, this volume aims to shed new light on the relation between diplomacy and performative culture in the public sphere.